Retro Planter with red geranium. Cant help it. 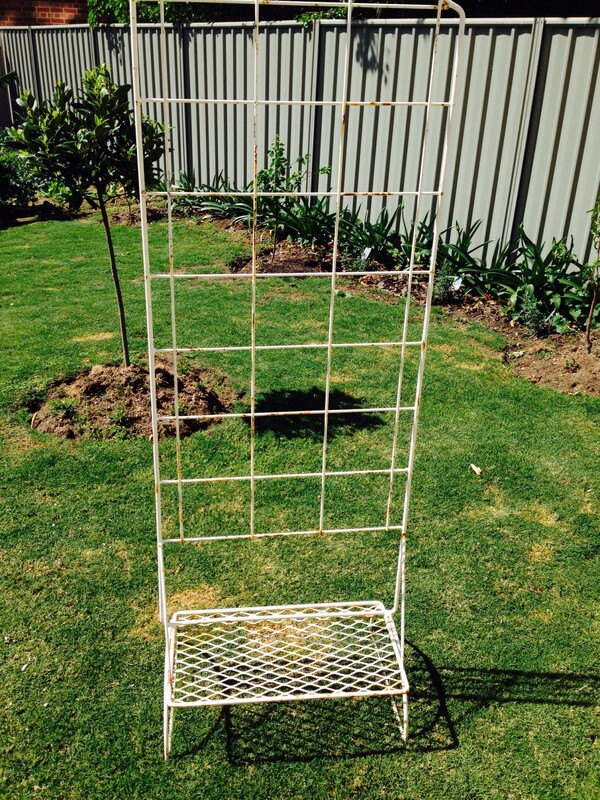 I love to rescue things from second hand shops and give them a new lease on life On another visit to McKay’s Mart, I found this retro plant stand. I thought it had potential and was worth the effort to fix it up. So I took it home, cleaned it well then, gave it a couple of coats of paint. I just used exterior acrylic paint, like Dulux Weathershield. A semi gloss is always a good choice for items which are a bit “rustic” because it will not highlight the imperfections the way a full gloss does. I then needed to find a suitable pot to rest on it. I found a ceramic one and then a plastic inset pot. 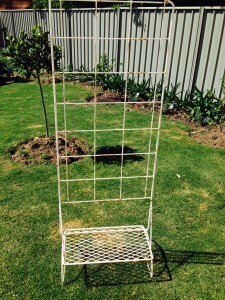 I planned to put it on a verandah so having water dripping from it would not be ideal. 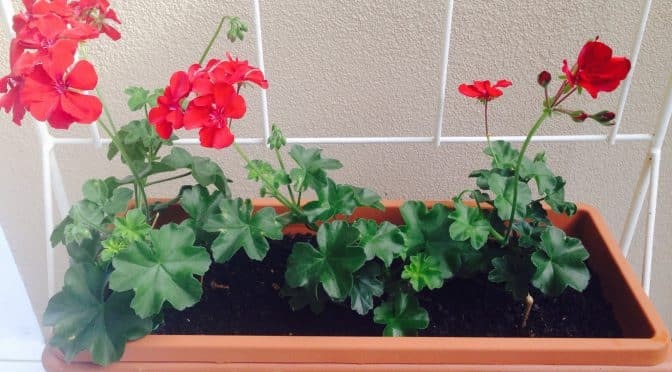 I’ve noticed lately that Geraniums are having a revival. I think that’s great, especially in our climate because they are tough survivors. But at the moment you can pay a pretty penny for them in the nurseries. I think people have been turned off them sometimes because if they are neglected for years they look unruly. But really with a little care they are very pretty, easy to grow, easy to propagate and can be used as cut flowers (yes they can). 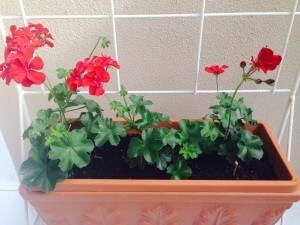 If you cut a bunch of geraniums and put them in a vase at home you will do they plant a favour, have a lovely bouquet and you might be surprised to see that some of them will grow roots in a short period of time. But I’m diverging. 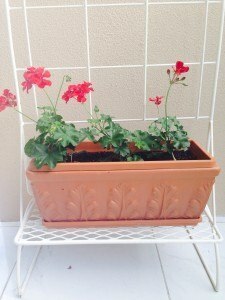 I got some cuttings of a climbing red geranium and put them in my pot with some quality potting soil and watered in well. 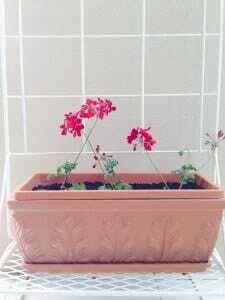 Now after several weeks they are looking like this. 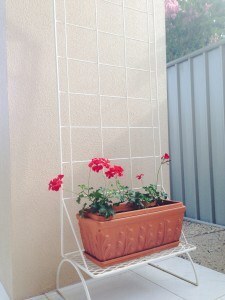 What at a great way to improve the look of a dull corner. A nice distraction from the colour bond fence. 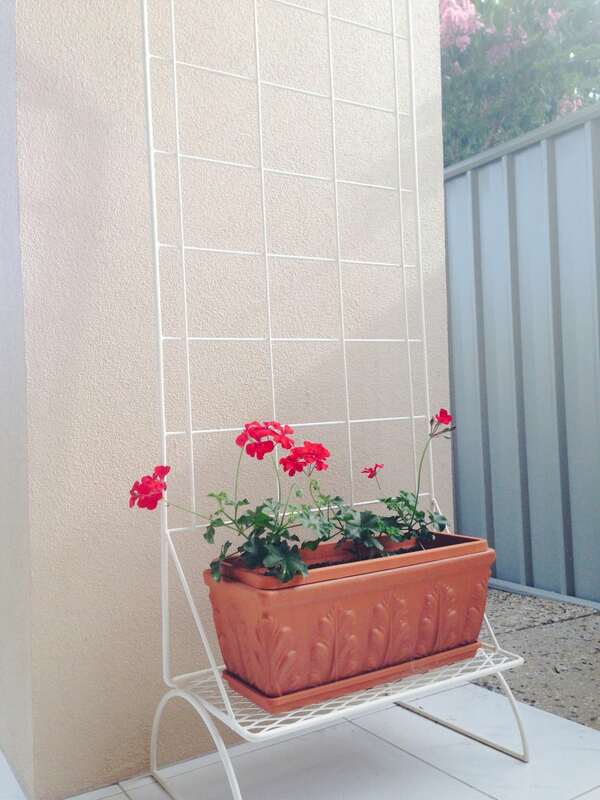 So with a bit of imagination garden features don’t necessarily have to be expensive. So bring on the geraniums and be amazed what a few cuttings can bring you. Remember with gardening, the fun is in the growing!